Neighborhood book exchanges are celebrated for providing free access to books. But the open invitation to “take a book or leave a book” can result in more taking than leaving—even taking all the books to sell. Here, we discuss what it means to offer books for free, and whether you can steal a free book. Two iSchool colleagues and I made neighborhood book exchanges the subject of an exploratory research investigation that outlasted the neat boundaries of graduate school. Our work has informed my ideas of how to think about book exchanges and some of the less flattering issues that present themselves. Lately, I’ve been thinking about book theft at book exchanges—people pilfering books from exchanges to sell on the street, specifically. And while our research did not focus directly on this issue, it often lurked in the periphery, and in one case surfaced in our interviews with stewards. One of our participants was struggling with this particular issue and we suspected—without confirmation—that book thefts plagued other exchanges in our study, too. 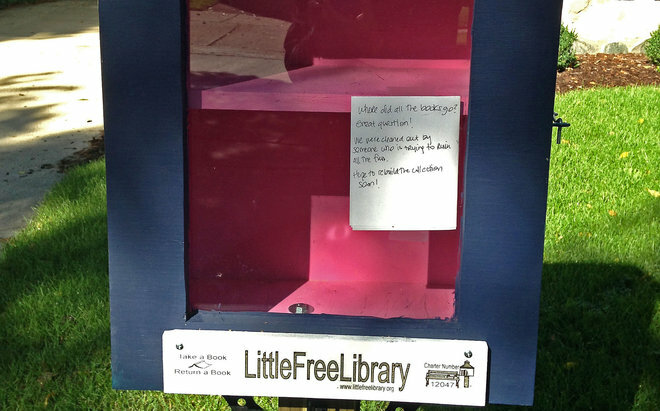 The Little Free Library® organization’s official take on book theft at book exchanges is both evasive and a trifle unsympathetic—possibly delusional. “You can’t steal a free book.”6 However vexing the logic of this statement, it’s nonetheless understandable. With a product that is described by many with the same adoration as a clumsy kitten and that allegedly delivers on promises of increased literacy and community, thieving book perps hardly reinforce the desired ethos. So how can there be a book thief among an elevated community? There can’t be. At least, we can’t call it stealing. Regardless of such triumphantly bad rhetoric, or perhaps because of it, we’re offered a fascinating discussion on the subject of what exactly constitutes ‘free’ things and how they are meant to be shared. ‘Free’ things occupy conceptually greasy ground in practice and in parlance, often belying a capitalist ethos. Common aphorisms, ‘Nothing is free,’ ‘There is no such thing as a free lunch,’ and my personal favorite, ‘There’s free cheese in a mouse trap,’ reveal the skeletal structure of the way business is often conducted. That even ‘free’ things can be accompanied with strings sits well within our everyday experience of acquiring goods and services in our economy. The stewards in our study worked hard to design, build, and maintain their book exchanges without necessarily being paid back for their efforts—or having an expectation to be paid. However, they all had expectations for something. They all sought to make changes in their neighborhood according to the way they think things ought to be. Whether they expected to meet their neighbors, provide props for interaction, or promote early reading, these activities required participation on the part of visitors which would presumably translate to a better quality of life for stewards and their neighbors. Even the most fundamental aspect of an exchange—returning or replacing book(s) you take—represents strings for which free things are typically attached. If we entertain the notion that you can’t steal a book from a neighborhood book exchange, can we extend that logic to say that it’s impossible to steal food from a food bank? A food bank, of course, is a resource where people who are food insecure can obtain nourishment without paying money—in other words, free food. About a year ago, in Vancouver, BC, I witnessed a disturbing scene that illustrates the folly of this logic applied to food banks and possibly book exchanges, too. At a busy intersection, an older woman, who was chomping down on an apple, was abruptly confronted by a couple of people who were clearly a little worse for wear. They accused her, rather rudely, of stealing the apple from the food bank. In fact, the apple was struck from her hand before the two accusers left the scene in an indignant huff. The half-eaten apple rolled into the gutter. What gives? How can you steal food that’s free? This scene was heartbreaking for me. I have experience volunteering at a food bank in Missoula, Montana, and I learned a few things that are relevant to this discussion. First, I would argue that food at a food bank is far from free. No money is exchanged, that much is true. Patrons, however, are cashing in their independence and swallowing a little pride every time they visit this resource. Despite our best efforts to put them at ease, I had a sense of the humiliation many people faced going through the formal process of acquiring food there. Second, food at the food bank was finite. Incoming and outgoing food in the food bank was tightly regulated. In order to serve all the hungry families, we followed a strict protocol. Goods were allocated with purpose and precision so that everyone who needed food could get some. And if a patron circumvented those rules while procuring food, sanctions were enforced. Common infractions included coming to the food bank too often (at our bank more than once a month was discouraged) or perhaps grabbing food from the rear entrance. While these rules were not always strictly enforced, they were in place to protect the resource for all who needed it. I can’t imagine the staff of the food bank in Vancouver running after the hungry elderly woman to fetch back a piece of fruit that she grabbed off the rear loading dock. Nor do I think it would be warranted. Was it stealing? I imagine taking an item without going through the intake process went against the food bank’s rules. It definitely rankled some of the other hungry people who are dependent on the food bank. I have to admit that the scope of the indiscretion makes it seem silly to talk of stealing. But what if this lady took a 30lb turkey or cleaned out an entire aisle worth of food? Most people wouldn’t hesitate to call that stealing. And since stealing is a concept that does not require a volume dimension to define it, perhaps we must consider taking a single apple stealing, if for no other reason but consistency. The food bank, as an organization, has rules it communicates to its patrons, written protocols it must follow as an organization, and a board to which it’s beholden. A book exchange may have rules associated with it, but they are not always advertised and are often poetically obtuse—making them vulnerable to opportunistic interpretations. For example, the exchange in our study that has been getting pilfered has this painted around its door: “Got a book that you don’t need? Leave it here for someone else to read. Consider it a neighborly deed.” This phrase is proportional to its cuteness as a structure, yet, as rules go, not exactly comprehensive. But if taking free books from a public book exchange, where an invitation to take a book is communicated, and selling it on the street or to a used book store makes us too squeamish to call it ‘stealing,’ what do you call it? Consider the most basic, topical raison d’être of book exchanges—a public platform to trade books with your fellow humans. The participants in our study held lofty ideas for which the exchanges are used and incidentally, trading books was not among the more vocalized reasons. For example, many stewards in our study wanted neighbors to meet each other or wanted an opportunity to meet their neighbors. Some stewards wanted to simply provide a space where people will interact in an otherwise unused space. Again, these desires are accompanied by expectations and are hemmed in by rules or mores. But importantly, reselling exchanged books for profit does not exactly square with any of these reasons for creating an exchange. In fact, it girdles the steward’s (in our study sample) reasons for creating them and undermines the longevity of the resource itself. I think everyone can agree that taking books from a neighborhood book exchange with the intent of selling them goes against the spirit of a book exchange. Even the folks at the Little Free Library® could get behind that, I believe. But I’m going to set foot in a place they are, oddly, reluctant to go. I’m going to call it straight up stealing. Click here to see Part II in this series. This entry was posted in Research Reflections and tagged Book Thieves, Little Free Library, Neighborhood Book Exchange, Vandalism. Bookmark the permalink. Hi. This is such a valuable discussion. At least one person comes to our book exchange (Napier at Salsbury in Vancouver, BC) every day and scoops up all the best books people have contributed … and then sells them to local used book stores. One guy even comes in his car and loads it up — probably drives a route to hit all the exchanges. What to do? The quality of the books in the exchange has plummeted because of this skimming of the best ones.